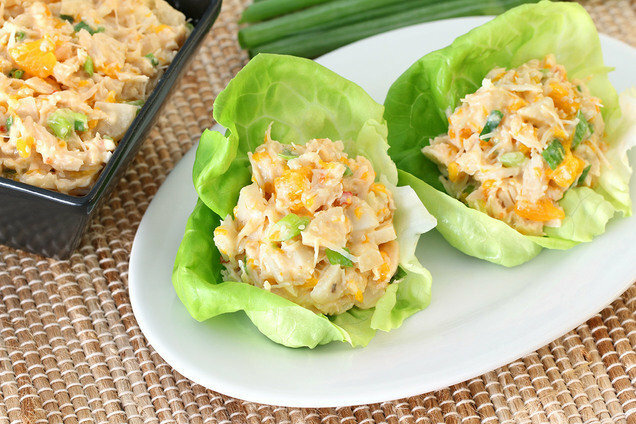 This scoopable salad is like the lovechild of a crisp Chinese chicken salad and creamy Waldorf chicken salad! Fresh, fast, and so versatile: Enjoy it in lettuce cups, as a sandwich, over lettuce… or right out of the bowl! Canned chicken works fantastically well in this recipe... Try it! If you’re overly skeptical, feel free to use shredded or finely chopped cooked chicken breast instead. In a large bowl, combine mayo, chili sauce, and seasonings. Mix until uniform. Add chicken, and stir to coat. Hungry for More 10-Minute Lunches? Help a pal out -- click "Send to a Friend" to send them easy recipes!